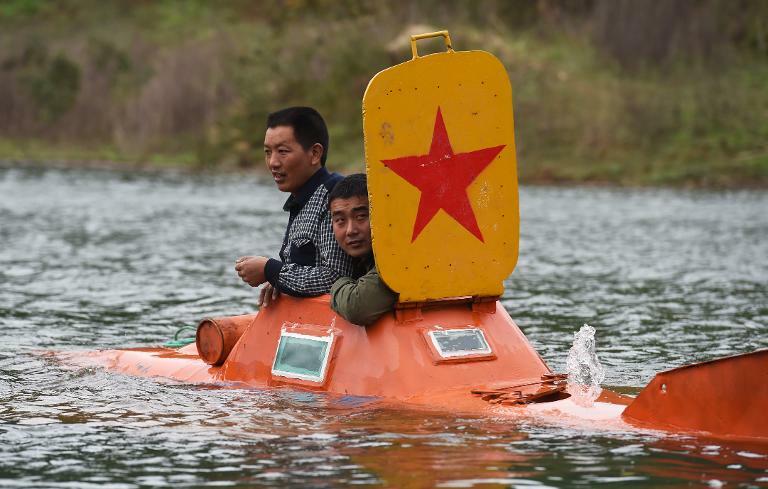 In the village where he was born, a Chinese chicken breeder emerged from a lake of green to tell of his life beneath the waves in a homemade orange submarine. Tan Yong bolted together his two-tonne craft, christened the “Happy Lamb” after a popular cartoon character, in just nine months and has steered it down to depths of eight metres. The 44-year-old is one of the growing ranks of rural Chinese do-it-yourself inventors whose individualism contrasts with the collective farming of past decades. 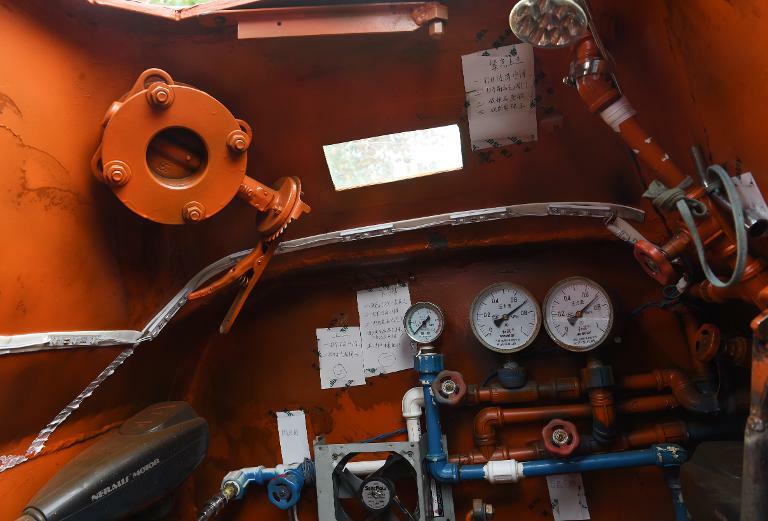 In his electric vessel, gauges and air pressure dials were screwed to the cabin wall above plastic piping that would look appropriate beneath a kitchen sink, while handwritten operating instructions were stuck up with sticky tape. Electric cables spewed from an array of fuseboxes, and a gas canister was positioned on the floor. Tan was born just two years after the Beatles released their 1968 hit Yellow Submarine, but he grew up in rural poverty and says he does not know any songs about coloured underwater vessels. At a national level China has increasing naval ambitions and Tan, who makes his living selling chickens, first hatched the idea of building a submarine two years ago, launching a prototype in March. He scraped an extra layer of sealant around the portholes before waving cheerily as he closed the hatch, emblazoned with a red Communist-style star. The craft — powered by five car batteries — chugged away from the banks of the Danjiangkou reservoir, with a friend aboard and many more of them cheering as they looked on from beneath a grove of orange trees. The engine whirred and bubbles rippled the lake’s still surface as it gently descended, leaving a barely visible outline before disappearing entirely. But his mother stayed away from the demonstration. “He’s had a habit of making things since he was small. Toys, boats, model guns and things like that,” said Wang Mingfeng, 65. Launching himself into the life aquatic, Tan is one of a number of amateur inventors — dubbed “Peasant Da Vincis” — who have in recent years bashed together home made planes, helicopters and even tanks, apparently with little consideration of practical value. They include a hairdresser from Zhejiang province, who built a one-seater aeroplane with wheels from a motorised wheelchair and a seat scavenged from a go-kart. In late 2012 a farmer in Hebei province grabbed worldwide headlines ahead of the supposed Mayan apocalypse with a range of “survival pods” hewn from fiberglass. This year, the creations took a military turn when Jian Lin, a 31-year-old farmer, drove a homemade tank through a village in Sichuan province. Tao Xiangli, a young man from a remote spot in eastern Anhui province who now lives in the capital, blazed a trail into the depths in 2010 with a home-made submarine featured in a Shanghai exhibition on the work of eight rural tinkerers. “They are determined and fearless, in that they are not afraid of mockery from others,” the show’s curator, artist Cai Guo-qiang told AFP. “People in the countryside under the Communist regime used to collectively work and live together, and there was no room for individualism,” he added. A silence hung over the lake in Hubei province as Tan lingered undetectable to those on the shore. Tan’s underwater journeys have not always been smooth, and he told earlier of a scary moment eight metres down. “There’s a lot of water pressure on the steel panels, they were crushed like a plastic bottle,” he said. “I was very nervous. And then there was a large banging sound. But minutes after diving, the submarine’s red star broke surface again, and Tan reemerged. “No problem!” he said with a grin. He has commandeered a shed outside his parents’ ramshackle farmhouse as a personal workshop, where scrap metal litters the dirt floors. Tan claims materials for the submarine cost him just 30,000 yuan ($5,000), though admits the time spent on its construction put strains on his marriage. “If I make another submarine, I will get down to 30 or 50 metres without any problems, I’ll just make the steel a bit thicker,” he said.